1) : Moves to the previous screen. 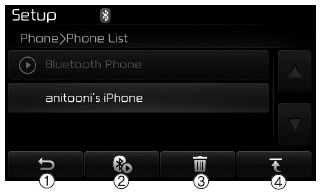 2) Connect/Disconnect Phone : Connect/ Disconnects currently selected phone. Only phone books within connected phones can be downloaded. 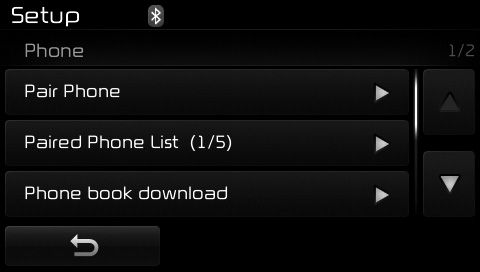 Also check to see that your mobile phone supports the download feature. To learn more about whether your mobile phone supports phone book downloads, refer to your mobile phone user’s manual. The Phone book for only the connected phone can be downloaded. Before downloading, check to see whether your phone supports the download feature. 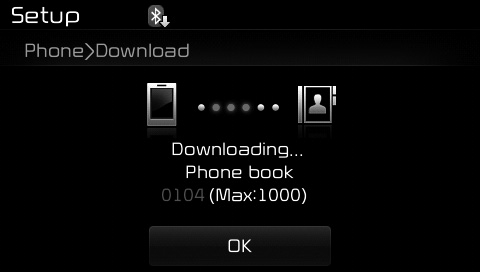 The Phone book is downloaded from the mobile phone and the download progress is displayed. Up to 1,000 phone book entries can be saved for each paired device. Upon downloading phone book data, previously saved phone book data will be deleted. However, Phone book entries saved to other paired phones are not deleted.